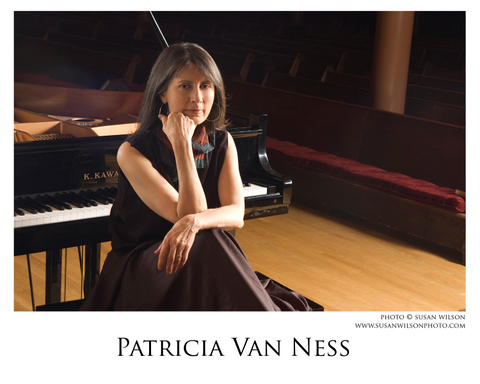 Composer, violinist, and poet Patricia Van Ness draws upon elements of medieval and Renaissance music to create a signature voice that has been hailed by musicians, audiences, and critics. She has been called a modern-day Hildegard von Bingen 1,2, with her ability to compose music “ecstatic and ethereal,” “both ancient and new” 2,3. As in medieval aesthetics, her music and poetry explore the relationship between beauty and the Divine. Patricia Van Ness’s work has had an impact that is both local and global. She is Staff Composer for First Church in Cambridge, Massachusetts (Peter Sykes, Music Director) and has been an invited lecturer at Harvard University and Boston University. Her music has been commissioned, premiered, and performed by numerous musicians and organizations throughout the world, including The King’s Singers (UK), the Heidelberg New Music Festival Ensemble, Chanticleer, Mannerquartett Schnittpunktvokal (Austria), the Celebrity Series in Boston, the Spoleto Festival Orchestra, Peter Sykes, Coro Allegro, and the Harvard University Choir. Her work has been presented in Rome and Assisi in Italy; the Musica Sacra Festival in Maastricht, Holland; and in halls and cathedrals throughout Italy, Austria, Finland, Germany, Japan, Hong Kong, Puerto Rico, Sweden, Latin America, Canada, Latvia, Russia and the United States. She has been awarded residencies with the Boston Landmarks Orchestra and with Coro Allegro. Ms. Van Ness is currently composing new music for each of the 150 Psalms. The texts are in English, Hebrew and Latin using the Psalter, the Hebrew Text, and the Liber Usualis. In 2015 she was commissioned by Cappella Clausura (Amelia Leclair, Director) to compose a multi-psalm concert piece; this resulted in Birds of the Psalms, a ten-movement work that was premiered May 2016. A live-in-concert CD of this premiere has been commercially released. In 2017 Coro Allegro (David Hodgkins, Artistic Director) commissioned a similar grouping for concert use: Psalms of Luminous Rescue, a ten-movement work, was premiered in May of 2018 by Coro. Ms. Van Ness has received numerous awards and grants, including the 2011 Daniel Pinkham Award from Coro Allegro (David Hodgkins, Artistic Director). Europe’s prestigious 2005 Echo Klassik Prize was awarded to the ensemble Tapestry (Laurie Monahan, Director) for their recording “Sapphire Night” with music by Hildegard von Bingen and and a nine-movement work by Patricia Van Ness, and Chamber Music America awarded “Album of the Year” to Tapestry’s The Fourth River, containing two of Van Ness’s works. Ms. Van Ness’s music may be found on Amazon, iTunes and other online stores; The King’s Singers’s The Best of the King’s Singers and From the Heart; Chanticleer’s Sound in Spirit recorded on Warner Classics; on Telarc International Recordings’s Angeli (Ensemble P.A.N). and The Fourth River (Tapestry); on MDG Classics’s Sapphire Night (Tapestry); on Birds of the Psalms and Passionately Unconventional: Madrigals and Motets by Nuns of Bologna, Moderna, and Ferrara, Cappella Clausura (Amelia LeClair, Artistic Director);In the Clearing, and somewhere i have never traveled, Coro Allegro; on Parma Recordings’s In Paradisum (In Paradise), Coro Allegro; on Sing the Glory! and Glorious the Song, The Harvard University Choir (Edward Elwyn Jones, Choirmaster); Albany Records’ A Marvelous Love, Carson Cooman, organ; Passionately Unconventional: Madrigals and Motets by Nuns of Bologna, Moderna, and Ferrara, Cappella Clausura (Amelia LeClair, Artistic Director); and Advent and Other Music of the Liturgical Year, released by the composer. Her scores are available on her website (www.patriciavanness.com). My Heart is a Holy Place is published by The King’s Singers Choral Series, distributed by the Hal Leonard Corporation and available here. Ms. Van Ness is a member of American Composers Forum, ASCAP, and the International Alliance for Women in Music. She is a former member of the Board of the Cambridge Society for Early Music and currently serves on the Musical Advisory Board of Cappella Clausura (Amelia LeClair, Artistic Director). She lives on the coast of Maine with her husband, Peter Marks. 2015 Composition Grant awarded by the Special Projects Committee and Special Projects Fund of the San Francisco Chapter of the American Guild of Organists. "Cloister Garden #3" (2015) 8½" x 15½"
Click here for more information about fiber art by Patricia Van Ness.